I am not alone in saying that the Spotify Discover Weekly playlist has changed the way I listen to music. Through this weekly playlist of personalised suggestions, I have been able to discover new music I otherwise would never have heard off. Released every Monday, the Discovery Weekly playlist is the perfect way to start the week. If like me you have thought a week is a long time to wait, then Halleluja there is a solution. Some Spotify developers have come together to create a hack for exploring millions of songs instantaneously. It's rather fitting name is Discover Quickly. 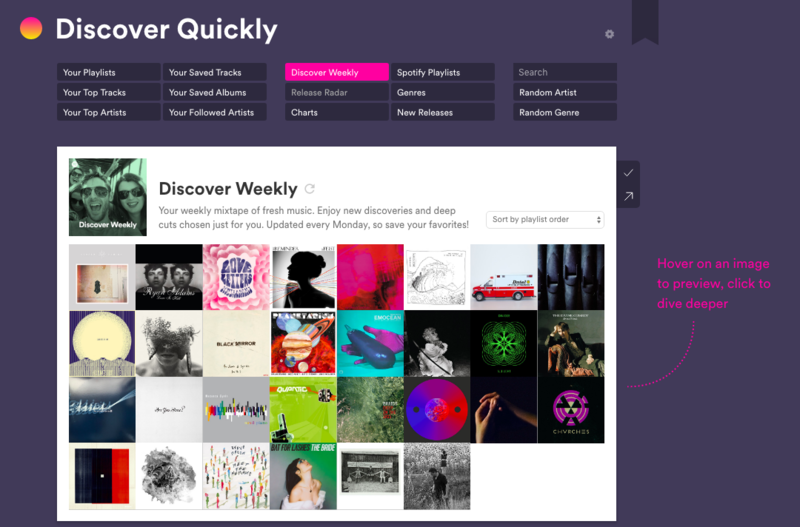 The Discover Quickly interface brings up a grid of album covers based on your current Discover Weekly playlist. What is super cool about this grid is you can organise your playlist from so many different variables, from the release date, slowest to fastest, happiest to saddest and even from the most to least danceable. Once you drag your mouse over the album cover, it starts playing the track halfway through. If you hear something you like you can click it to zoom in on that song and artist. When you click on that song and artist, it brings you to a separate dropdown, that gives you details of the artist, their albums, top tracks and other related artists to click into. By clicking on a track it also saves it to a new playlist which you can easily export to Spotify. If like me you're slightly nerdy with organising your music based on what mood you may be in this hack is a real timesaver. 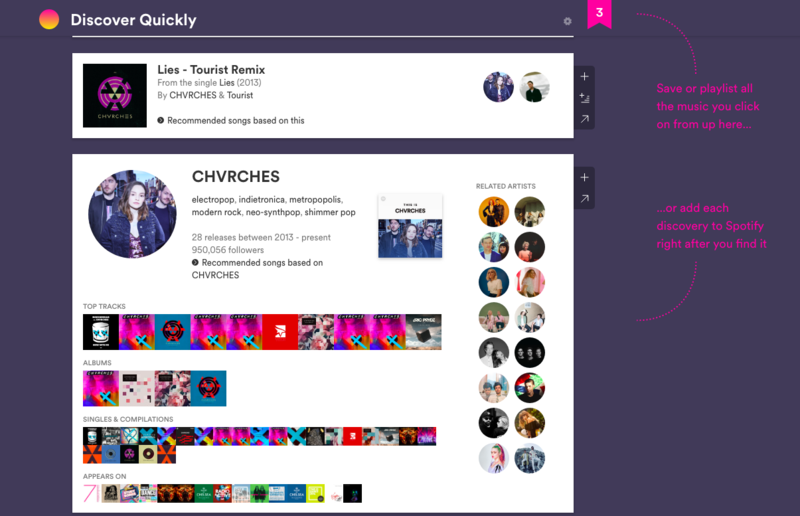 It allows you to curate your Discover Weekly playlist in minutes. It doesn't just work on the Discover Weekly playlist, you can pull any playlist a from your Spotify account and start discovering new music. You can try the Discover Quickly app for yourself here. Also Read: Netflix Is Turning Us Into True-Crime Experts, But Is This Obsession Unhealthy?